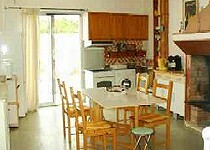 A self-contained apartment with flexible accommodation suitable for 2 to 6 people. Two double bedrooms. 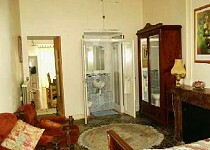 A twin bedoom and family shower room (with walk in shower with multijet system) and wc. The large family living room/kitchen is well equipped and includes a dining table and chairs (seats 4 or 6) and a three seater settee which makes up into an occasional bed. There is an entertainment corner with a hifi system (cd player, tape system and a radio) and a tv with UK channels. The open plan kitchen is well equipped and contains a gas cooker with 4 ring gas hob, oven and electric grill, a microwave, a large family fridge freezer, washing machine, coffee maker (filter and expresso) etc etc. The apartment is centrally heated for the colder winter evening plus a large traditional chimney with a wood burner installed. There is also internet access via a wifi connection. The largest double bedroom has a second separate access from the main house which together with the ensuite shower room and wc make it popular with grand parents or grown up children who require more independence. The room is furnished using antique French furniture and has a separate settee and 2 easy chairs as well as the beautiful double bed. It has been converted from one of the original reception rooms of the vigneron. It therefore contains decorative plasterwork, a marble fireplace and an original tiled floor together with shuttered French windows which allow access to a small balcony at the front of the house. 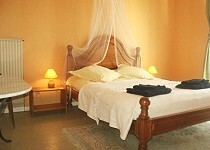 If choosing the one bedroom option then this bedroom is provided.